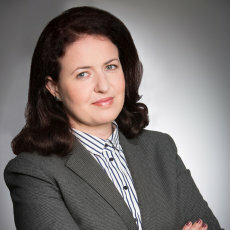 Angela Porumb is a long standing and well-reputed litigation practitioner, having over 20 years of extensive experience in civil and commercial disputes in front of Romanian Courts, at all levels. Angela is notable for her expertise in many complex cases, representing major multinational companies as well as private local companies acting in various sectors, such as real estate and construction, banking, energy and public utilities, in all types of disputes including commercial, fiscal and administrative litigations, as well as disputes regarding judiciary reorganization and bankruptcy proceedings. Due to her extensive legal knowledge, Angela has been acting in numerous types of litigation cases handled by Muşat & Asociatii, our portfolio of large corporations, banks or other institutions benefiting from her top-notch legal counsel with substantial experience and practice in complex, sensitive and controversial issues. 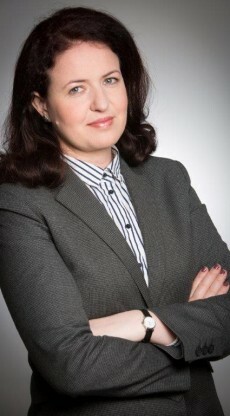 Furthermore, her activities also include successfully representing clients in disputes regarding corporate & commercial matters, as well as on Infrastructure & PPP/ Public Procurement projects, advising both private and public actors and public utilities. She has successfully represented our clients in front of all important courts of law in Romania, including the Supreme Court of Justice and the Constitutional Court, being unanimously praised by the clients for her promptness and proven effectiveness in solving difficult cases. Succesfully representing the Romanian Presidency in front of the High Court of Justice, in relation to the cancelation of the report whereby the Romanian National Integrity Agency (ANI) claimed Mr Iohannis’ breach of the legal incompatibility requirements, as well as in front of Alba Iulia Court of Appeal, in relation to the cancelation of the report whereby the Romanian National Integrity Agency (ANI) ascertained Mr Iohannis’ breach of the conflict of interests requirements. One of the largest energy providers in Europe, in a highly complex administrative litigations, regarding the Put Option exercised by the Romanian State, acting through the Rumanian Government under a sale purchase agreement, involving claims in excess of EUR 520,000,000,000. Representing one of the largest gas and refining businesses in the country, in major litigations in Romania, in the context of the upcoming repayment by the Client of a historical debt in total value of EUR 570,000,000 to the Romanian State. Further acting for the Client in one of the highest-profile disputes, initiated against CNVM (the National Securities Commission) involving claims of USD 50,000,000 (the biggest damage ever claimed by a private investor from a public authority in Romania) and challenging several administrative deeds issued by CNVM. (Enel Investments Holding). Representing one of the major financial investment company in various corporate disputes with its most significant minority shareholder and challenging administrative deeds issued by ASF (SIF TRansilvania). One of the largest property developers in Europe in a litigation concerning construction and development of a major real estate project, with a claim value in excess EUR 60,000,000. An affiliate of the Swiss global health-care companyin various pharmaceutical litigations dealing with claims worth over EUR 100,000,000. The largest pharmacy chain in Romania in relation to Romanian fiscal policy imposed on pharmacists exposing the company to taxes amounting over EURO 15,000,000. The mandate includes negotiations with decision making authorities, representing the Client during the fiscal inspections and before Romanian and European competent courts of law. A leading independent producer of electric and thermal power in Romania against a local company in a complex commercial litigation arising from the enactment of the privatization agreement for the largest Romanian manufacturer of soda ash, water glass, soda glaze and soda-derivative products. Acting for a leading gas distribution company in Romania with respect to various claims arisen from services agreements regarding the design of their gas distribution network. Public individuals involved in politics in connection with the conflict of interest legal provisions, including complex administrative litigations arising from the controversy of election legislation.